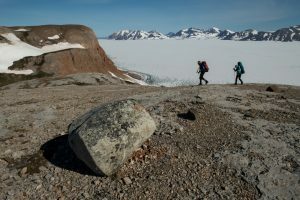 The main aims of EAGRE18 were to explore the Wegener Halvø peninsula of East Greenland for the purpose of searching for caves. The hope was that the caves would yield valuable sediments or speleothems that would be useful for palaeoclimate research in an area that is highly sensitive to changes in sea ice. Furthermore, the scientific arm of the project would allow the Greenland Caves project to expand to a new area, thus helping to further develop high-profile cave-based palaeoclimate research in the Arctic. The peninsula is known to be karstified, and potential cave entrances had previously been noticed by a geologist working at CASP. The geologist had photographed the entrances some years before and provided the images to the expedition leader along with the rough locations. It was based on this knowledge that the expedition took place. Both high-elevation fossil caves and a low-elevation fastflowing resurgence were on the ‘target’ list. In addition, the aim was to try to make this expedition more environmentally friendly, thus the team planned to travel by sailing yacht with the Top to Top Global Climate Expedition between Iceland and Greenland. The expedition took place between July 26th – August 19th, 2018. Members included expedition leader Prof. Dr. Gina Moseley (Uni. Innsbruck); Robbie Shone (Shone Photography), and; Chris Blakeley (Petzl), who together formed the caving contingent of the expedition. In addition, they were joined by Swiss family Schwoerer including Dario and Sabine (the parents), Salina (13), Andri (11), Noe (9), Alegra (7), Mia (3), and Vital (1), plus their teacher and friend Mirjam. It was a very full 50-foot yacht! The three cavers met Family Schwoerer and the Top to Top boat (called Pachamama) in Ólafsfjörður, Iceland, on the 29th July. A few days were spent making final repairs to the boat after it was nearly sunk by a storm in November 2017. Shopping was also bought for 13 people for a month, which Sabine juggled to fit in the boat in one of the biggest games of tetris ever seen! Finally, around 10pm on the 1st August, the weather turned and they set sail on their two-day crossing to Greenland. It started off badly for Gina and Robbie who were extremely sea sick; Chris joined the club a few hours later. Gina postulated for some time whether nausea and nautical have the same origin, or if the similarities are just a coincidence. Finally, after half a day, the sea sickness medication kicked in, and everyone recovered and was able to enjoy the remainder of the journey. They took it in turns to do watch duty, Gina and Robbie on 2-4, 8-10 am and pm, Chris and Andri on 4-6, 10-12 am and pm, and Salina and Mirjam on 12-2, 6-8 am and pm. 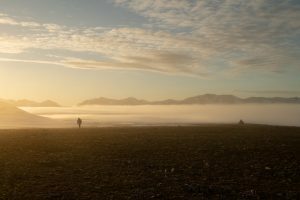 As they approached Greenland, a thick fog surrounded the coast. Everyone was on high alert looking out for icebergs as they neared their destination. Finally, around 11.30pm on the 3rd August, they anchored in Ittoqqortoormiit. Several days were spent in Ittoqqortoormiit getting to know the locals and playing football with the Greenlandic children. Further progress to Wegener Halvø was hampered by thick sea-ice that still surrounded the peninsula. Every day the satellite images were checked and nothing was changing (even now on the 3 rd September, access would not be possible). 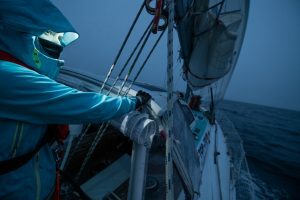 Since sailing to Wegener Halvø seemed unlikely this year, the decision was made to make the final part of the journey by helicopter. Top to Top dropped the caving team off at Constable Point on the 8th August, in preparation for a flight on the 9th August. It was not an ideal situation but it meant that the expedition could continue. Two weeks after leaving home, the team finally reached the peninsula! Base camp was set up so that the cook and food tent were downwind and closest to the ice-covered fjord than the sleeping tent. Despite now being on land, night watches needed to be continued in case any large furry locals decided to visit camp. It is fair to say, everyone was very tired after many nights of watches. On August 10th, the first cave leads were targeted. Site #1 was located northeast from base camp. Reaching it involved a 4.6km hike with a steady climb to a coll, following musk ox tracks, and then traversing around a ledge. Unfortunately the ‘cave’ could not be reached directly because of a large snowfilled gully that split the cave-containing wall from the ledge. The team still did not fully have an answer though as they couldn’t see into the shadow from their vantage point. Robbie employed the drone, saving many hours of climbing, and discovered it was a large alcove. The team travelled back to camp via a different route, trying to pick up another cave target, but was unsuccessful in finding the site in the photograph. The next day the three travelled southwest from base camp. The going was tougher with harder uphill sections and larger river crossings. After hiking 4.5 km, they reached the bottom of the cliff containing the cave around 6pm in the evening. A lose and daunting scree slope with a tricky-looking climb stood in front of them. They removed the unessential gear from their c.20kg rucksacks and progressed with lighter bags. Chris went first and made the most progress, nearly reaching the cave. Robbie flew the drone once he was within a range that the drone could see the cave from. Disappointment once again. These were large rock shelters too. The team only had one full day left before the helicopter pick-up early on the 13th . It was arranged this way in order to keep costs down. The final main target was the resurgence, but this needed an overnight flycamp in order to be reached and thus was not possible given the short time remaining. Having walked c.20 km around the peninsula, the team were convinced that Wegener Halvø is unlikely to yield any caves of interest for further exploration or palaeoclimate studies in the future.